It seems spring is finally here for much of the country. This means it’s time to get your lawn sprinkler system ready for the spring and summer season ahead. If your lawn sprinkler system is just coming out of hibernation, you’ll want to make sure your system is in good operating condition. This often means calling your local lawn service to make sure everything within your sprinkler system is running properly. It also means you, as a diligent homeowner, need to look out for some things as well. Long winters can cause leaks. This means wasted water and a more expensive water bill. Landscapers say it’s a good idea to first check for problems above ground. You should also check your water meter to make sure the system is not leaking. You can also wait and check your water bill. A higher-than-usual bill could indicate a leak. If your lawn irrigation system is tied to a pump and well, you may need to prime your pump back up if you drained it. If you have questions, check with your lawn care professional. Some people will choose to fully drain the pump, which may not be necessary if you provide adequate insulation to the pump to keep it from freezing. It’s also important to make sure the ground is thawed before using the sprinkler system. Just because spring is officially here does not mean we won’t see the occasional hard frost in April. The soil in the yard should not be so hard that it can’t be moved or penetrated with a shovel. You want the soil to be pliable. 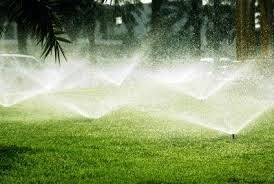 These are all basis things that should be done before using your lawn sprinkler system this spring. It’s still a good idea to contact a lawn care professional to make sure you have all your bases covered before using the lawn sprinkler system for the first time this spring.